Nobody works harder than school teachers. So many kids are disadvantaged by their backgrounds, yet teachers are expected to overcome these problems with limited time, limited resources, and limited support from parents. Nobody knows this better than Luis Soriano, a primary school teacher from La Gloria, Colombia. Since 1990, Soriano has donated his free time to the biblioburro project: basically, he uses two donkeys to travel out into remote villages to deliver books, attempting to serve the poor and nominally illiterate of the farming communities with reading material to foster literacy.Not only does Soriano run the 140-ish book Biblioburro, he and his wife also have the largest free library in Magdalena, Colombia, with a collection of over 4200 donated books. They also run a community restaurant in their free time. 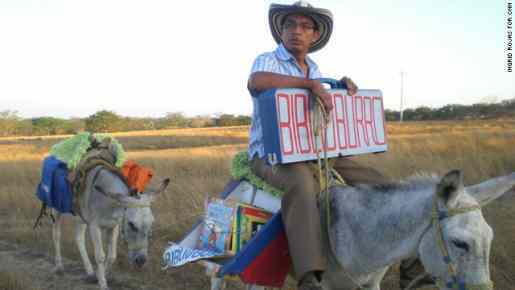 What little free time they might have, given that Soriano’s burro-back journeys often require him to travel 8 hours there and back. Even breaking his leg and being attacked by bandits hasn’t stopped the Biblioburro!